On the 21st of September, an inter-departmental talk was organized by EOSTRE in the spirit of cross departmental interaction. The discussion was conducted by Prof. Satish Deshpande of the Dept. of Sociology and was themed around George Akerlof’s Nobel Prize winning 1970 article ‘A Market for Lemons’. Prof. Deshpande sought to analyze higher education in India in the context of lemons. The present article aims to catalog some of the ideas conveyed and debated over the meet. The term ‘lemon’ is the colloquially used term in American vernacular for a defective used car (as opposed to a good used car or ‘cherry’). The idea revolves around the concepts of information asymmetry, adverse selection and moral hazard. Let us consider a market for used cars with various levels of quality associated with the cars. This quality is directly observable to the seller of the used car but not to a prospective buyer. This situation is referred to as ‘information asymmetry’, where one party to a transaction has more information than the other party. Given that the buyer does not know the quality of any given used car, it is reasonable for him to base his judgment on the average level of quality of used cars in the market. If a buyer is only willing to pay the price of a car of average quality, then it may no longer be worthwhile for the seller for a good, well-maintained and never abused car to sell at a price lower than his car is worth. So these sellers would opt to exit the market. But as the sellers of the best quality cars exit the market, the average quality of cars in the market also declines. The buyers would now be willing to pay a commensurately lower price prompting the next best quality segment of used cars out of the market. This process would continue until the market simply collapses. This is an instance of adverse selection, where the lowering of price prompts good cars out of the market leaving behind a pool of cars of inferior quality. The situation also bears striking similarity with Gresham’s Law of bad money driving out the good (because bad and good money are being valued the same by the system). But whereas Gresham’s law has all participants operating under perfect information, here we deal with participants constrained by information asymmetry. A quick mathematical example would help elucidate the idea: consider a market for used cars where the quality ‘Q’ varies uniformly between [0, 1]. A seller of a used car will be willing to sell his car at any price P≥Q where Q is the quality of his car. A buyer is willing to buy a used car at some premium K*Q, where K is any real number in (1, 2). Let K = 1.5. Since the quality of cars is uniformly distributed over [0,1], the average quality of a car in the market (Qavg) is 0.5. Moreover, since it is only this average quality that is observable to buyers in general, the price they would be willing to pay in the market is K*Qavg = 1.5*0.5 = 0.75. Thus, all sellers with quality of cars in the range (0.75, 1] would opt out of the market. Now the quality Q of cars in the market is distributed over [0, 0.75] and consequently Qavg drops to 0.375. Now the price buyers are willing to pay is 1.5*0.375 = 0.5625. Again, all sellers with cars of quality in the range (0.5625, 0.75] opt out of the market. This leads to a further decline in the average quality, a commensurate decline in price offered by buyers and further decline in quality (and consequently prices) until the market collapses. So how does one perceive higher education in India in the context of a lemon? The argument runs that the last decade or so has witnessed a manifold increase in the number of technical education institutes. Given a degree of lack of opacity regarding the quality of the education offered by these institutions, they are able to charge a high fee for an inferior product (a lemon). Before we examine the veracity of this argument and the similarities or dissimilarities with the situation conceptualized by Akerlof, it is instructive to highlight the rapid growth of the higher education sector in India. The number of technology and engineering institutions has jumped from 187 in 1980 to over 3000 in 2013. The approved admissions in the year 2011-12 were approximately 10.66 lakh. In terms of intake per million of population, there has been a meteoric rise from 152 in 1993 to 888 in 2011. Most of the growth has been restricted to the private unaided sector. The implication here is that high demand for technical education coupled with corruption among regulatory authorities has allowed for the overlooking of qualitative deficiencies and approval of many new institutions. The perception of the education business as a low cost, high cash flow enterprise with an opportunity to leverage on real-estate and tax free status of pseudo-non-profits has encouraged private players and opened the floodgates for numerous private enterprises that have compromised quality to save money on soft and hard infrastructure. Before we proceed, it would be useful to differentiate between the consumption and investment aspects of education. Information regarding the consumption aspect is more readily available to students. The physical infrastructure, aesthetics of the university campus, quality of peer groups, campus life etc. are readily perceivable by students. However there exists information asymmetry when we consider the investment aspect. A college is typically better placed to determine the quality of education it provides. It is able to track alumni and is aware of its own interaction with industrial groups. It must be emphasized again that here we are focusing on undistinguished ‘segment-D’ universities where the signaling power of the university degree is not readily known, which would categorize the vast majority of private universities in operation. Students will enter the labor market only upon completion of their course. Consequently, they are incapable of judging the quality of the education through any direct test beforehand. Students are unsure of their talents and are only able to judge them by going to school. Furthermore, these colleges are able to exert significant control over the flow of information regarding their own past records. They may gloss over, obscure or take creative liberties with details of their performance, or simply resort to creating distractions by offering fringe benefits. Finally, we stress on the lack of information with students regarding not only universities, but also alternative prospects that might be open to them. The highly competitive nature of the education system, peer influence, skewed public perceptions and a host of other factors may keep even the best educated parents and students from objectively exploring non-mainstream opportunities. This information asymmetry would imply that the price students would be willing to pay would be determined by the average quality of academic institutions rather than the particular institution in question. Just like the presence of lemons in the market drove out sellers of cherries, the ability of poor quality institutions to price themselves at par with good quality institutions would lead to the exit of quality institutions. Except, in the Indian context, it has not led to a decline in numbers but simply a decline in the quality of education offered as institutions cut corners to improve profitability. This would explain the rise in the number of technical institutions accompanied by a steady decline in quality over the years. What has precipitated this scenario? We begin by discussing some of the reasons that might have contributed to the creation of the prevalent structure and allowed for its continued sustenance. 1. The most obvious explanation is that Indians place a high value on job oriented professional programs. Furthermore, there is a great degree of social prestige associated with the acquisition of a technical degree. Given the dynamic nature of the job market and the high volume of graduates produced; lack of higher education places severe limitations on the prospects and career opportunities of those without a degree. And so, the willingness to pay a high fee to acquire a degree may simply be perceived as the conversion of one form of social capital (say being born into means or influence) into another. In this context, Prof. Deshpande used a novel diagram to highlight the role of an imperfect market in determining the structure. In a developed nation with a well-functioning market , the person capable of paying the most would be the one availing the highest quality product. 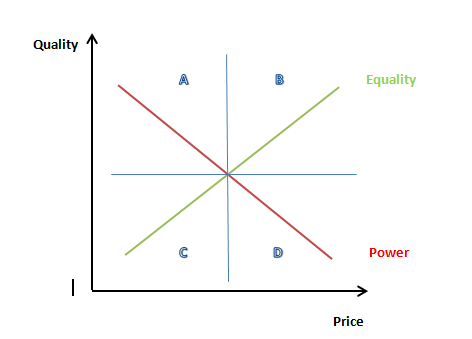 This would give rise to an upward sloping Quality-Price schedule: the “Equality” curve in the above diagram. In a developing nation where the markets aren’t particularly well developed, we may see the downward sloping “Power” schedule. Here those with some market power (knowledge/merit, influence, reservations, quotas etc. )are able to acquire quality education at lower prices. Furthermore, those left out must now pay more for inferior quality education in the absence of any alternative. The lower the inherent ‘merit’ of a student, the more he must pay to compensate. This would explain region “D” of the above graph. From the seller’s side, region “A” may be explained by the aided/subsidized public institutions. 2. Graduates produced in the system find employment within the system itself. To look at schooling as an investment, under perfect market conditions, a rational well informed student would opt to study at an institution only if he/she could expect to recover the cost of schooling from increased future earnings and enjoy higher future consumption rates. This is a simplifying view and it should be noted that here we have disregarded human capital benefits and all positive externalities arising from the acquisition of education. Typically, only about a quarter of the engineers graduating every year in India would be deemed competent for employment (The Emerging Global Labor Market; Farren et al. (2005)). Under perfect market conditions, the least competent engineers who (it is reasonable to assume) graduated from the colleges offering the lowest quality education would be left out in the job market. Consequently, given the lack of returns, these colleges must either lower their tuition costs or shut down. But given the vast surplus of engineers in the market, this is exactly what has not happened. One explanation offered by Prof. Deshpande was that many of the students graduating from these colleges find employment within the ecosystem itself i.e. with the college/university or its parent body. This would be a form of vertical integration and would indicate a self-sustaining industry structure. This is an interesting and plausible explanation that warrants empirical analysis. However that lies beyond the scope of this article. 3. Firms pay wages that justify the high costs of schooling. 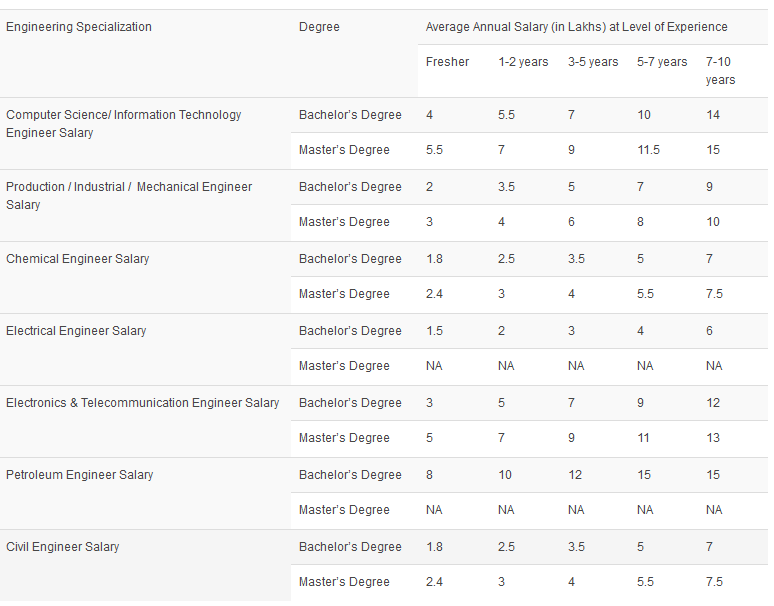 The above table shows pay-scale trends of various engineering streams in India. These are average figures which cover about 80% of population. Engineers from premier institutes would command significantly higher pay. In a perfect market, the presence of surplus labor should typically drive wages down until the market is cleared. But we do not see that happening here. The reason would be that firms want to minimize labor force turnover and retain talent, given the immense heterogeneity in the quality of the labor pool, and therefore pay efficiency wages. If prospective students base their decisions on this average without adjusting for the probability of actually securing a job, it would make it seem worthwhile to pay the high fees. 4. Lapses in the regulatory system. The failures of the appropriate regulatory body (the AICTE in the case of India) in monitoring and upholding quality standards would lead to the same fiat value assigned to all degrees regardless of the level of training/education behind them. Thus, an accreditation system designed to guide prospective students ends up exacerbating the prevalent information asymmetry and is turned into an effective instrument for sub-par universities to conceal their academic standards. Instead we will focus briefly on the role of vertical integration and franchise models in delivering cost-quality parity in education. The first idea springs from the role of the government in subsidizing quality education. The rationale behind this subsidy is that the creation of an enterprising, well-trained and educated work force would eventually generate positive externalities within the country which would justify the cost of the subsidy (a kind of trickle down approach to growth). Similarly, if an ecosystem could be created where firms could tap into the positive externalities generated by their investment in education, say by the ability to tap the high quality labor produced, or to reap cost/technical benefits from research sponsored etc., it’d encourage greater industry-university interaction, promote investments and help improve the quality of education offered. The second idea is based on a franchise model. Since the underlying reputation of the franchise serves as its unique selling proposition, it creates strong incentives for the creation of strict quality control and internal auditing. We have already witnessed strong trends in this sphere at secondary and higher-secondary schooling levels. Their viability and success at a university level presents and interesting avenue for research and empirical work. To conclude, the discussion provided a fresh perspective to a very prevalent issue and the idea offers excellent and exciting scope for further research and exploration.